Engaged to Laura Carrío … has two children: Robinson and Angelina … named his son after his favorite baseball player, Robinson Canó ... Twitter: @ymoncada19 … Instagram: @ymoncada19 ... Received a record $31.5-million signing bonus from Boston ... Represented Cuba in the following international tournaments: 18U World Championships in Taiwan (September 2013), World Port Tournament in the Netherlands (July 2013), 16U World Championships in Mexico (August 2011) and the COPABE Pan American 16U Championship in Mexico in October 2010 ... Attended Eide High School in Cienfuegos. Spent his first full season in the major leagues ... Became the fifth player in franchise history (age 23 or younger) with at least 30 doubles, 15 home runs and 60 RBI in a single season, joining Chet Lemon (1977), Frank Thomas (1991), Paul Konerko (1999) and Carlos Lee (1999) ... Also became the first Sox player (23 or younger) to add 10-plus stolen bases to the previous numbers ... Was one of six players in the American League with at least 30 doubles, five triples, 15 homers and 60 RBI, joining Boston's Andrew Benintendi and Mookie Betts, Detroit's Nicholas Castellanos, Oakland's Matt Chapman and Texas' Jurickson Profar also accomplished the feat ... Hit the first five leadoff home runs of his career, tied for the third-most in the AL and sixth-most in the majors ... His 217 strikeouts led the majors and were the second-highest total in major-league history behind Arizona's Mark Reynolds (223 in 2009), Chicago's Adam Dunn (222 in 2012) and Baltimore's Chris Davis (219 in 2016) ... Hit 15 of his 17 homers off right-handers and 10 at Guaranteed Rate Field … batted .244/.324/.435 vs. right-handers, compared to .209/.287/.297 vs. lefties ... Batted a monthly high .301 (28-93) in September … led off 97 times (.246/.324/.434; 14 HR, 48 RBI), hit in the No. 6 spot in 20 games and No. 7 in 14 ... Committed 21 errors, fourth-most in the major leagues ... Made his first career Opening Day roster, starting at second base on 3/29 at Kansas City ... Hit his first home run on 3/31 at Kansas City, sparking Chicago's three-run eighth inning rally en route to a 4-3 win ... Reached base four times (2-3, 2B, 2 BB, 2 RS) for the third time in his career on 4/9 vs. Tampa Bay ... Stole a base in four consecutive games from 4/16-20, the longest streak by a Sox player since Alejandro De Aza from 5/29-6/2/12 (also four) ... Hit a two-run home run on 4/17 at Oakland … connected on his first career grand slam on 4/18 at Oakland, becoming the fifth-youngest White Sox to hit a slam ... Fell a single shy of the cycle on 4/23 vs. Seattle … tripled in the first inning, doubled in the second and homered in the fourth ... Leadoff Lumber: Connected on his first career leadoff homer on the first pitch on 4/25 vs. Seattle and added his second on 4/26 at Kansas City … became the fourth Sox player to lead off consecutive team games with a homer, joining Adam Eaton (6/25-26/16), Alejandro De Aza (5/8-10/13) and Kenny Lofton (7/18-19/02) ... Was on the disabled list from 5/5-14 with a strained left hamstring suffered on 5/4 vs. Minnesota ... Connected on a three-run homer on 5/23 vs. Baltimore, snapping a 15-game drought ... Hit his third career leadoff homer on 6/5-1 at Minnesota … marked his first multi-hit effort since 5/17 vs. Texas ... Established a career high with six RBI on 6/24 vs. Oakland, hitting a bases-clearing double and three-run homer … his six RBI were the most by a Sox second baseman since Tadahito Iguchi's seven on 6/25/06 vs. Houston ... Snapped an 8-8 tie with a game-winning, bases-clearing triple in the 12th on 7/3 at Cincinnati … marked his second career go-ahead hit in the ninth or later (8/10/17 vs. Houston) ... Reached base four times on three hits, including a solo home run, and a walk on 7/15 vs. Kansas City ... Connected on his fifth leadoff home run on 8/1 vs. Kansas City … his RBI double in the 10th on 8/3 at Tampa Bay marked his third career game-winning hit in extra innings (also 8/10/17 vs. Houston an 7/3/18 at Cincinnati) ... Homered on 8/21 vs. Minnesota, the fourth of his career from the right side … went 2-4 with a RBI on 8/25 at Detroit, snapping a streak of 19 consecutive games without a multihit effort ... Hit a game-tying, two-run double in the sixth on 8/27 at the Yankees … hit a two-run home run on 8/31 vs. Boston, his former team ... Recorded consecutive three-hit games on 9/20 at Cleveland and 9/21 vs. the Cubs … reached the 60-RBI mark on 9/20. Was named Baseball America's Minor League Player of the Year after combining to hit .294/.407/.511 with 31 doubles, six triples, 15 home runs, 62 RBI, 72 walks, 94 runs scored and 45 stolen bases over 106 games between Class A Salem and Class AA Portland in the Red Sox organization ... Tied for fifth in the minor leagues in steals and tied for 11th in runs scored ... Made his major-league debut with Boston in September … appeared in eight games with the Red Sox, including four starts at third base ... His contract was purchased from Class AA Portland on 9/2 and made his major-league debut that night at Oakland as a defensive replacement at third base in the seventh … drew a walk in his first plate appearance and scored a run in the eighth ... Made his first start on 9/3 at the A's, going 2-5 with a double, RBI and two runs scored … collected his first hit and RBI off Daniel Mengden … recorded his first multihit effort on 9/4 ... Became the first player to earn Baseball America's top minorleague honor as a member of the Red Sox organization, as well as the first Cuban native to win the award in its 36-year history ... Led Red Sox farmhands in steals and ranked among the organizational leaders in runs scored (2nd) and extra-base hits (T2nd, 52), homers (4th) and average (6th) ... Scored four runs in a game three times and stole multiple bases nine times, including three on three occasions ... Opened the season with Salem and was named to the Carolina League mid and postseason All-Star teams ... Reached base safely in each of his first 20 games, including a 15-game hitting streak from 4/10-26 (.351, 20-57) ... Was named CL Player of the Week for 5/2-8 after hitting .320 (8-25) with three doubles, three homers, nine RBI, 13 runs scored and six walks ... Compiled a 10-game hitting streak from 5/12-21 (.364, 12-33) and batted .380 (19-50) in June … drove in five runs on 6/2 vs. Myrtle Beach ... Was promoted to Portland on 6/21 … batted .307 (27-88) with seven home runs, 18 RBI and 21 runs scored over 18 games in July for the Sea Dogs ... Was named Most Valuable Player of the All-Star Futures Game on 7/10 in San Diego … started at second base for the World Team and hit a go-ahead, two-run homer in the eighth. Recorded his first career multihomer game on 7/18 at Trenton … posted a 10-game hitting streak from 7/25-8/12 (.317, 13-41) ... Played for Surprise in the Arizona Fall League, hitting .292 (7-24) with one homer, three RBI and six runs scored over six games before suffering a season-ending sprained left thumb ... Following the season, was ranked by Baseball America as the No. 2 Prospect, Fastest Baserunner and Best Athlete in the Red Sox organization … entered the season rated by MLB.com as the No. 1 Prospect ... White Sox acquisition recommended by Joe Butler, John Tumminia and Keith Staab. Played two seasons for Cienfuegos in Cuba's Serie Nacional ... Was a teammate of José Abreu in 2012-13. May 15, 2018 Chicago White Sox activated 2B Yoan Moncada from the 10-day injured list. 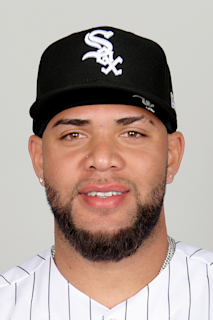 May 5, 2018 Chicago White Sox placed 2B Yoan Moncada on the 10-day disabled list. Left hamstring tightness. September 5, 2017 Chicago White Sox activated 2B Yoan Moncada from the 10-day disabled list. August 25, 2017 Chicago White Sox placed 2B Yoan Moncada on the 10-day disabled list. Right shin bone contusion. July 19, 2017 Chicago White Sox recalled 2B Yoan Moncada from Charlotte Knights. July 13, 2017 Charlotte Knights activated 2B Yoan Moncada from the temporarily inactive list. July 8, 2017 Charlotte Knights placed 2B Yoan Moncada on the temporarily inactive list. July 7, 2017 Charlotte Knights activated 2B Yoan Moncada. July 7, 2017 Charlotte Knights placed 2B Yoan Moncada on the temporarily inactive list. May 26, 2017 Charlotte Knights activated 2B Yoan Moncada from the 7-day disabled list. May 18, 2017 Charlotte Knights placed 2B Yoan Moncada on the 7-day disabled list retroactive to May 16, 2017. March 21, 2017 Chicago White Sox optioned 2B Yoan Moncada to Charlotte Knights. December 6, 2016 Chicago White Sox traded LHP Chris Sale to Boston Red Sox for CF Luis Alexander Basabe, RHP Michael Kopech, RHP Victor Diaz and 3B Yoan Moncada. October 12, 2016 Boston Red Sox activated 3B Yoan Moncada. September 30, 2016 Boston Red Sox reassigned 3B Yoan Moncada to the minor leagues. September 2, 2016 Boston Red Sox selected the contract of 3B Yoan Moncada from Portland Sea Dogs. July 14, 2016 Portland Sea Dogs activated 2B Yoan Moncada from the temporarily inactive list. July 9, 2016 Portland Sea Dogs placed 2B Yoan Moncada on the temporarily inactive list. June 21, 2016 2B Yoan Moncada assigned to Portland Sea Dogs from Salem Red Sox. April 5, 2016 2B Yoan Moncada assigned to Salem Red Sox from Greenville Drive. February 29, 2016 2B Yoan Moncada assigned to Boston Red Sox. March 12, 2015 Boston Red Sox signed free agent 2B Yoan Moncada to a minor league contract.